We all worked with a partner and worked hard together. We had a list of animals which we had to find in our classroom and we took photos using the Ipods and wrote their names too. It was great fun! On Friday 20th March there was a solar eclipse. We learnt that this is when the Moon comes between us and the Sun. We knew that it would be dangerous to look directly at the Sun so we used a special mask to protect our eyes. CAN YOU RECOGNISE ANY OF US? We got a letter from the Natural History Museum asking us to help them with their research. So we became palaeontologists and started investigating. 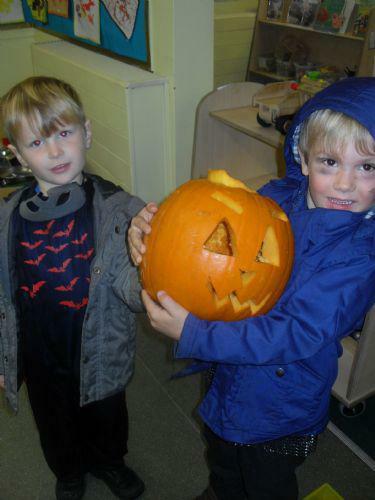 Look at all the fun we had while we were learning ! We used non fiction books, pictures and computers to help us with our research. We had an amazing time investigating ice and working out how we could melt it more quickly. We found out that salt speeded up the thawing process. We also talked about how rubbing our hands together helps to keep us warm and learnt that the scientific name for this was friction. Some of us used puppets from "Frozen" to help us with our investigation. 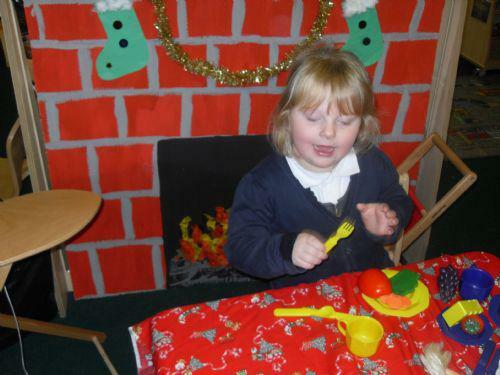 We have had great fun making Christmas dinner in our festive home corner. We can write Christmas cards and post them in our Post Office. 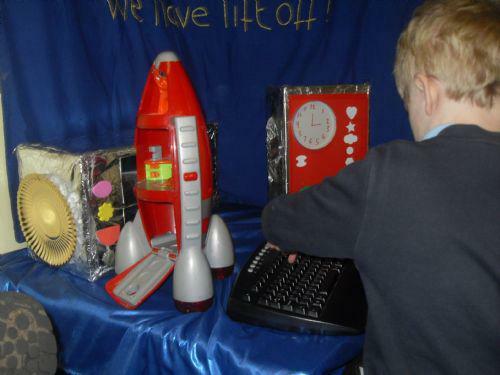 Our space station area is a fantastic place to play as we learn about space.